The 180,000 Bedouin in the Negev have never been welcome, says Oren Yiftachel, a geographer at Ben Gurion University of the Negev in Beersheva. They are descendants of a few thousand who managed to avoid expulsion from the southern semi-desert region during the 1948 war that founded Israel. Many of the surviving Bedouin, including the Tarabin, were forcibly relocated from their extensive ancestral lands in the 1950s to an area close to the Negev’s main city, Beersheva, Prof Yiftachel said. Israel declared the Bedouin lands as “state land” and established a series of overcrowded “townships” to house the tribes instead. “The stated goal is one of ‘Judaisation’,” Prof Yiftachel added, referring to a long-standing policy of concentrating the rural Bedouin into urban reservations to free up land for Jewish settlement. About half of the Negev’s Bedouin, some 90,000, have refused to move. According to a recent report from the Association of Civil Rights in Israel (ACRI), the townships have “continuously ranked as the poorest, least developed and most crime-ridden towns in Israel”. The refuseniks, such as the Tarabin, have faced unrelenting pressure to leave their 45 rural communities, none of which is recognised by the state. The villagers endure “third world conditions”, according to ACRI. “The unrecognised villages are denied basic services to their homes, including water and electricity, and the villages themselves have no master plans,” Mr al Sana said. As a result, he added, the villagers are forced to live in tin shacks and tents because concrete homes are invariably destroyed by the authorities. In the past two years, several shacks as well as the local kindergarten in Amra have been demolished. The stark contrast between the dusty encampment of Amra and the green lawns and smart villas of Omer, only a stone’s throw away and the country’s third wealthiest community, is unsettling even for some of Omer’s 7,000 residents. He said Amra had been treated as nothing more than an eyesore until the mid-1990s when the powerful mayor, Pinhas Badash, decided that the Tarabin were both harming property values and obstructing the town’s expansion plans. As Omer’s new neighbourhoods reached the limits of Amra, Mr Badash stepped up the pressure on the villagers to leave. A few years ago he pushed through the building of a new community for the Tarabin away from Omer. Two-thirds of the tribe relocated, while the remainder fought the attempted eviction through the courts. “It was a very dirty business in which those in the tribe who left first were offered cheap land on which to build while the rest were threatened that they would be offered nothing,” Mr al Sana said. 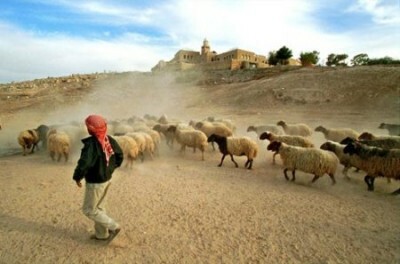 Amra’s remaining Bedouin have found themselves surrounded by a tall wire fence to separate them from Omer. Two gates, ordered by the courts to ensure the Bedouin continued to have road access through the town, were sealed this year. Since the beginning of the summer police patrol Amra’s side of the fence around the clock and the Tarabin report that a private security firm chases off any of them found inside Omer. Nissim Nir, a spokesman for Mr Badash, denied that the Tarabin were being hounded. Omer made a generous offer to relocate them from their “illegal” site, he said. Recently Mr Badash announced that thousands of acres around Omer would be forested with the intention of stopping the Bedouin from returning to the area once they had been evicted. Mr Tarabin, 33, accused the police of being little more than hired hands carrying out Mr Badash’s plan. A report by Human Rights Watch last year severely criticised Israel’s treatment of the Bedouin. Jonathan Cook is a writer and journalist based in Nazareth, Israel. His latest books are “Israel and the Clash of Civilisations: Iraq, Iran and the Plan to Remake the Middle East” (Pluto Press) and “Disappearing Palestine: Israel’s Experiments in Human Despair” (Zed Books). His website is www.jkcook.net .